I hope you don’t mind, but in honor of Thanksgiving, I’m offering some leftovers — in the form of a repost. 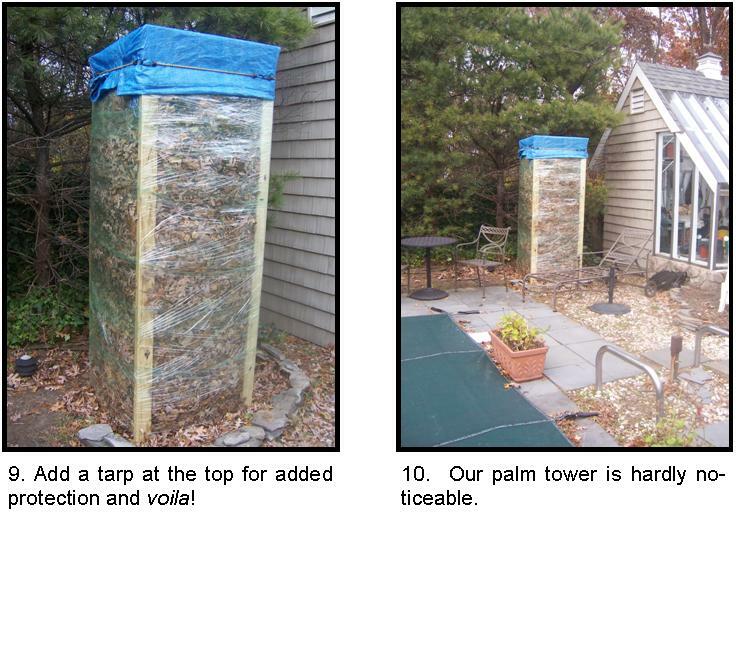 I’ve reworked it a bit to make it more palatable, but the gist is the same: a couple of crazy Long Islanders will do just about anything to give their yard a tropical look. Besides, it’s way to cold and blustery today — too cold to hold the camera to redocument this process. Enjoy — and fresh material is on its way. Sadly, coconut palms will not grow in our Zone. Nor will most other palms found around the world. So what’s a palm lover to do? 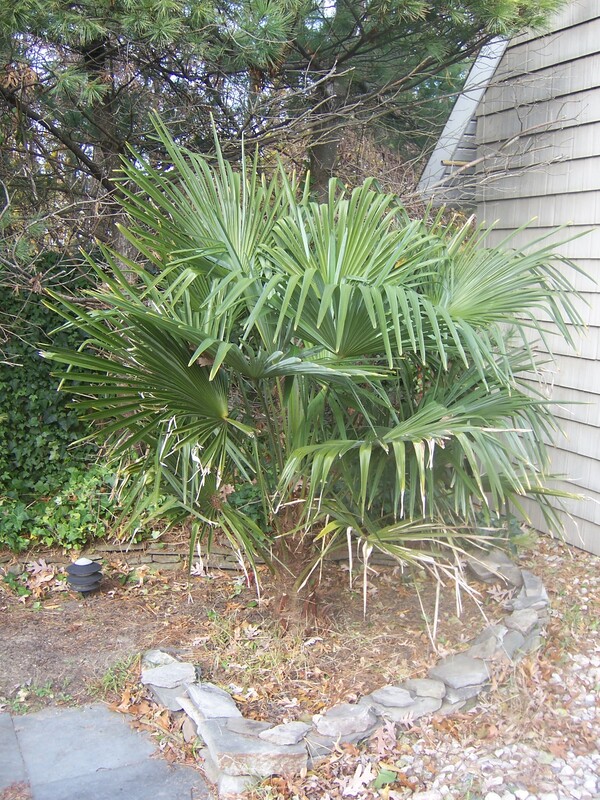 About 8 years ago, we purchased a windmill palm, Trachycarpus fortunei to be exact, from Stokes Tropicals. Originally grown in China, the windmill is one of the hardiest of palms, able to tolerate a fairly severe freeze and a light winter snow cover. What a big beast that thing is! Gracious. Your post was a great one today, I was smiling and reading the entire story. Great photos, too! It doesn’t get -40 there, does it? Hmmmm. I need a conservatory. Awesome leftovers; I missed it the first time around. It doesn’t get that cold — thankfully! But the palm does manage to survive in its cocoon. In the spring, when we unwrap it, the only damage is on some winter burn on some of the frond tips. Be well! It’s a genius idea- may have to try that with something that’s a zone 4. It was much easier when the tree was smaller — now it’s an effort, but certainly worth a try. Good luck! Yeah, my boyfriend loved the idea until he thought that part through lol. I agree with the comments above… this is an awesome post.. Question…how many years have you been doing this/has it worked? What is your growing zone there? Also, I wondered about when it warms up unexpectedly during say January or February does the plastic wrap and the stuffed leaves make for no ventilation and cause molding problems? 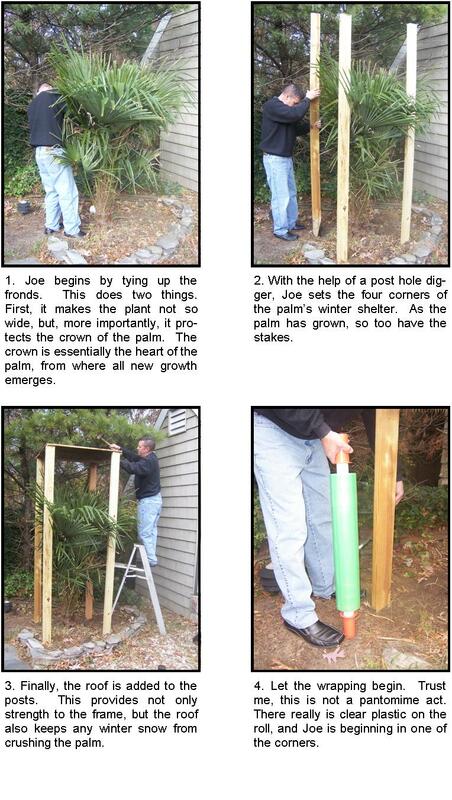 Thank you for sharing this and its great to see that Joe has his part in the garden too. as they say in England as snug as a bug in a rug. hope you’ll have a normal Winter, no nasty surprises and may Spring come early !!! yeah ! lovely and warm in your soft comfortable bed….and let it snow let it snow let it snow, lol ! A blue tarp? Wouldn’t brown have been more discreet? 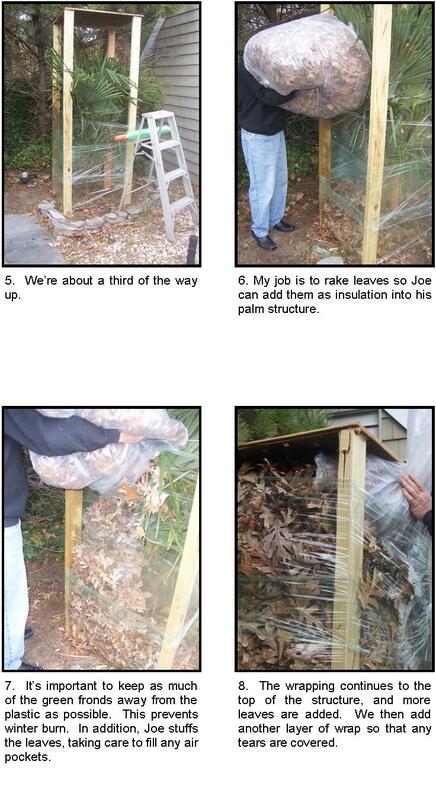 What a great post, I’ve always wanted a palm but was afraid of the winter maintenance, you (Joe) made it look fairly bearable. I think I’m going to try one and see how it goes. Maybe I will also tackle a banana plant too! Thanks for inspiring me. If I didn’t have Joe, I don’t think I would attempt it. In fact, I probably wouldn’t even have a palm tree on Long Island. Glad you enjoyed it. Always nice to hear from you. Be well! Planting a palm tree on Long Island is almost prophetic. Palms are one of Mother Nature’s engineering marvels: during a hurricane, the wind will bend them to the ground and they bounce right back up again. Wow! I can’t imagine this level of work to protect the palm, yet that’s obviously just ignorance talking. If you and Joe ever come to Southern California, please let me know! I love palms, and I’m trying to learn more about them. As you can imagine, they grow very well here, and there are so many. I am not great at distinguishing the differences, yet I’m really trying to learn. I think Joe would be amazed…I think we have more varieties than you’ll even find in Florida. It’s a fascinating study. Loved these photos–it takes a lot of work to be prepared for winter! Wow! Talk about dedication! I love it. I live in Indiana and have a little pineapple plant that I started from the top of pineapple this summer. I brought it in for the winter. We’ll see if it survives. My aunt actually got a pineapple from hers! That is a very fun project. We tried that years ago. The plant lived and lived, and we brought inside in winter and outside in summer — and never a fruit. We then passed it along to a friend in Florida — and he was able to literally enjoy the fruit of our labor. 🙂 Good luck with it! Maybe Florida is the trick. My aunt lives in Florida in the winter and takes her plant back and forth with her. The best I can do is a sunny window and a heat vent blowing on it. Maybe I could try wrapping it in clear plastic wrap like a terrarium! I had a client years ago here in the northern suburbs of Boston who wanted Palm Trees on his property. He had a huge swimming pool and concrete mountain water slide in the back that he wanted to look like a pool in the Islands. It was not my company and I was forced to oblige. A local nursery brought in three large Palms that we planted around the pool and one up front. In the early fall we dug them up and took them back to the nursery each winter. wow, you really got to love your palms to take on that extra work. way to go Joe. Perhaps when you retire the weather will be more conducive to palms down south?